60 Months Lease with 10% Cap Reduction, for $999.00 a month + Tax O.A.C. Comes equipped with: Ipod Connection, Yellow Brake Calipers, Yellow Tachometer. 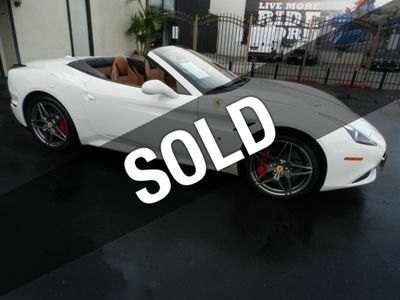 This Ferrari California also includes Air Conditioning, Power Driver's Seat, Climate Control, Tachometer, Dual Zone Climate Control, Power Steering, Telescoping Steering Wheel, Power Windows, Steering Radio Controls, Power Locks, Power Mirrors, Lthr. Steering Wheel, Driver Airbag, ABS Brakes, Passenger Airbag, Traction Control, Intermittent Wipers, Side Airbags, Dynamic Stability, Rear Defogger, Security System, AM/FM, Anti-Theft, CD Player, Touch Screen, Navigation System, Rear Spoiler, Sport Seats, Cup Holders, Heated Mirrors, Rear Fog Lamps, Roll Stability Control, Tire Pressure Monitor, 12v Power Outlet, HID Headlamps, Voice Control.